Excuse the bad hair day in the picture! 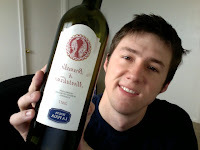 I just woke up a few hours ago and haven't done anything yet because I had to report on the wines I tasted last night. This was one of three really neat Italian wines I had a chance to taste and analyze. The previous two posts were the other two wines I tasted. 2001 Cabreo IL Borgo and the 2006 Campo Al Mare. The estate of La Fuga is located west-southwest of the town of Montalcino, between the estates of Camiliano and Castel Giocondo. Originally part of the Camiliano estate, this 75 acre property was split off in the early 1980s and sold. The owners developed it over two decades before selling it into the Folonari family holdings between June of 2001, when control was transferred, and February of 2002, when ownership was finalized. The La Fuga estate is situated at an altitude of 1,200 feet in an area of the Montalcino appellation considered to be among the finest. The microclimate is unique in that it yields wines with an exceptional balance between finesse and firm, supple structure. Of the estate's total surface area, half are cultivated. Twenty-five acres are planted to vines and the rest support olive orchards. The vineyards are registered under three separate appellations, with 16.25 acres classified for Brunello di Montalcino and 4.37 acres each classified for Rosso di Montalcino and IGT Toscana. The principal vineyard, which covers 11.25 acres and is entirely under the Brunello designation, is planted to 20 year old Sangiovese vines. The remaining vineyards are more recent, planted between 1993 and 2000. Vines are planted at a density of 1,600 to 2,200 stocks per acre. Maximum potential production is approximately 3,500 cases. Now what do you say we get into the wine! I'm going to taste it again right now and compare with my notes from last night. On the nose I get aromas of cherry cobbler, mandarin orange peel, chalk, soil, prune, wet leather, tobacco, and fruit tart. The friend I was tasting with last night said he detected the slightest touch of menthol but that nuance didn't resonate with me than and I don't smell it now either. I feel it's important to taste with other people because sometimes they will pick out things that you would have never thought of and it helps you to really dive into the aromas and flavors your not as familiar with. On the palate the wine has an amazing silky texture and is very savory. My mouth is absolutely watering after tasting this wine! Flavors of rustic cherry, cola nut, red-brick, prune, plum, bitter sweet chocolate chips, and figs all swarm the palate, and finish in a medium to long, dry cherry finish.